Such is the case of Tom Terrific. Much of what pioneering animator Gene Deitch established from 1957-58 subsequently began to show up in other TV cartoons. Before Sherman and Peabody, Tom and his dog Manfred traveled back in time. Before the likeness of Simon Bar Sinister appeared in Underdog, there was Crabby Appleton. Before Mr. Whoopie taught Tennessee Tuxedo and Chumly about science and history, Tom was explaining it. “It’s already been done, kid,” is not a problem when you are the one who invented the perfect pizza. I grew up watching Tom Terrific on the Captain Kangaroo show. I always was always excited to see what Tom would change into next. During his 26 episodes, he transformed into something 129 times. (18 of his transformations are pictured below – all 129 are pictured in my new book). Each transition called for Deitch and his staff of animators to create something new wearing the Tom funnel cap. Gene Deitch, who turned 93 on August 8, was hired by Terrytoons in 1956 to develop cartoons for television. Tom Terrific originated from a syndicated comic strip he created titled Terr’ble Thompson. 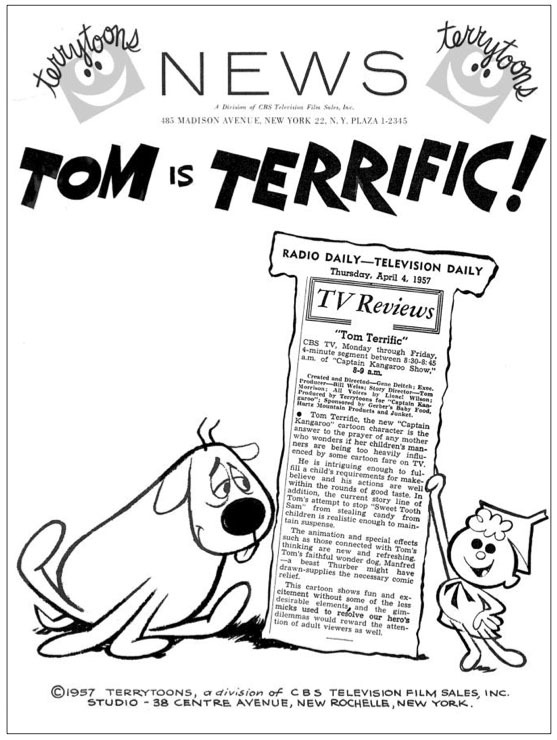 Two seasons of Tom Terrific were produced airing in 1957 and 1958. The cartoons, developed for inclusion in the Captain Kangaroo program, continued to rerun until the mid-1960’s. Paul Terry, the founder of Terrytoons, had sold the company to the CBS television network in 1956. Sadly, due to the hostile practices of producer Bill Weiss, Deitch only survived a couple of years at Terrytoons. Weiss fired him due to his insecurity. Weiss was about as creative as a wet sponge. Deitch was a master at character development creating real personalities for Tom Terrific and his supporting cast. His stylistic art and use of transparencies gave animation a new, streamlined look. Voice artist Lionel G. Wilson was a stellar addition to the cartoon series. Wilson did every voice. One of the best attributes of Tom Terrific is that it was family friendly, and appealed to both kids and their parents. Deitch was a pioneer in creating villains that were likable. Tom routinely gave his sleeping companion, Manfred, credit for many things, when no recognition was due. That’s because Tom encouraged others. He called himself “the greatest hero ever” in his opening theme, but never bragged. Tom was all about helping others against insurmountable odds. The show was about values and fellowship. The cartoon was filmed in black and white. It’s appropriate. Tom was just that way, no gray area for him. He is is clearly defined without any room for confusion. You knew where he stood. Tom was righteous. Regarding animation, Gene Deitch is a living legend. He won an Oscar for his 1960 animated short, Munro. He also was nominated for an Oscar in 1965 for his Nutnik cartoon short. He was also a recipient of the Winsor McCay award in 2003 for lifetime achievement in animation. 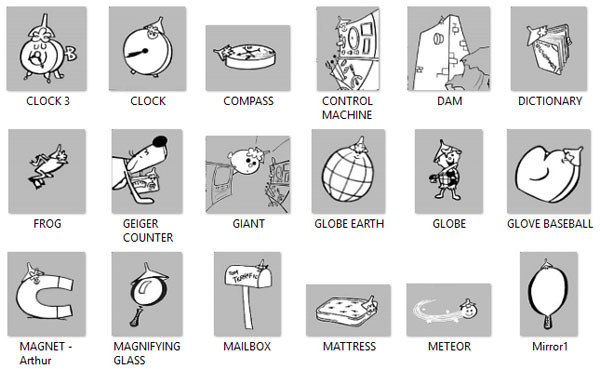 All 26 Tom Terrific episodes, which have stood the test of time, are on YouTube for everyone to enjoy. 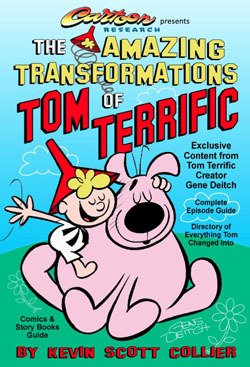 My new Cartoon Research mini-book, The Amazing Transformations of Tom Terrific is now available via Amazon. What a relief! Thank you! — By the way, child psychology says that children appreciate images with strong definition (as in the book, _It looked like Spilled Milk_). These cartoons were *made* for young children. Does anyone have a more specific date? I was born in 63 and remember seeing Tom Terrific. I must have been pretty young when they stopped rerunning them. I was born in 1966 and I remember seeing the Tom Terrific cartoons on CAPTAIN KANGAROO, so they had to have still been running, at least periodically, into the early-mid ’70s when I would have seen them. Tom Terrific certainly wasn’t part of Captain Kangaroo after about 1971-1972, which is when I started watching the show. Keep in mind that by this date, CBS had gone all-colour (some years behind NBC), and I think the black-and-white segments thus would have been expendable. As I remember it, “Tom Terrific” was being broadcast as early as 1958 on the weekday ‘Captain Kangaroo” show. Again, as I remember it, these cartoons gave way in the summer of 1962 to “Lariat Sam”, anther Terrytoons cartoon. I was not as taken with “Lariat Sam” as I was with ‘Tom Terrific”. But then, I was an unusual kid for my time: I did not much like Westerns! I remember seeing these in the early 70s on Captain Kangaroo as well, I was born in 66, and this would have been 70-73 or so. After that the Captain’s show was given a re-do and it along with some other features etc disappeared. Captain Kangaroo and Tom Terrific were part of my childhood. I loved the way Tom could shape-shift into anything. This brings back fond memories. I just read Gene Deitch’s book, For the Love of Prague. It’s a fascinating memoir of his life in the Czech Republic. I loved Tom Terrific! I wanted to own Mighty Manfred! It was so hard to find the cartoons even on tape for a very long time. I finally found a tape that had two adventures. I gave it to a young woman who worked at my local comic book store because she was Gene Deitch’s granddaughter and had never seen them. Great that they are on YouTube now. Whenever the episode of “Isotope Feeney’s Foolish Fog” came on, the one where he fires up the Fog machine, I would cover my ears because it made the most atrocious OOMP OOMP OOMP noise and I couldn’t stand to hear it. But I did like hearing Crabby Appleton sing one of his self-promoting theme songs – what good is a villain without his own little ditty where he’d tell the world how awful he is? I am thrilled with Jerry Beck’s Cartoon Research once again presenting a tribute to my Tom Terrific experiment, especially when a new Crabby Appleton is occupying our White House! Why yes! And Tom should turn himself into America and shake off that old meany! Just bumped into this comment. Thanks for that and for Tom Terrific. Regarding Tom Terrific appearing on Captain Kangaroo after 1966. By that year, at best, as Eric mentions, CBS decided to not include Tom in the Captain because they wanted all-color programming. However, I do recall seeing Tom on the Captain once in a while until the very early 1970’s as a “throwback.” So, it was no longer a feature of the Captain’s show, but every so often they’d pop a few episodes on viewers again for fun. A newspaper clipping in my files about Captain Kangaroo’s 20th anniversary season (1974-75) mentions that the series would be reviving some of the old Tom Terrific adventures as part of their season-long anniversary festivities. The cartoon that I remember being on Captain Kangaroo is Lariat Sam, which I guess came after Tom? Or did they run concurrently? Harry… The two series alternated for a while. Whereas Tom Terrific was the brainchild of Gene Deitch, Lariat Sam was the creation of a comic and writer named Gene Wood, who in 1965 transitioned into a new career as a game show announcer and host! I was watching Tom Terriffic in Australia in 1959 and it usually took some time for shows to get here in those days. Speaking of Tom Terrific aired in Australia in 1959, on February 1st, 1959, Tom Terrific was aired in Japan on Nihon Educational Television Co., Ltd. (NET) (currently known as TV Asahi Corporation) under the title “Tomu no Bouken” (Japanese: トムの冒険). However, like many Terrytoons stuff imported into Japan, the Tom Terrific (Japanese dubbed version) was very difficult to find on TV reruns, home video releases or the internet despite the legacy that Osamu Tezuka was a huge fan of Terrytoons, and they, along with Disney and Fleischer cartoons, probably due to the Japanese dubbed masters being lost, destroyed or the Japanese master tapes and/or film elements were sent back to CBS in the U.S.? Which caused modern Japanese viewers barely remember Tom Terrific or Terrytoons in general as of 2017. Also, there’s a link about the information about the Japanese version of Tom Terrific exist on MyDNS but the page is stub mostly the site did not the Japanese dubbed actors who voiced the characters since it went off the air for years. Also, there’s a link about the information about the Japanese version of Tom Terrific exist on MyDNS but the page is stub mostly the site doesn’t list the Japanese dubbed actors who voiced the characters since it went off the air for years. EDIT: I fix the grammatical errors in the new comment. Added book for further reading in Wikipedia entries for Deitch and Tom Terrific.